We’ve covered YouTube user Shesez’s “Boundary Break” series—which takes control of the camera of various video games and moves it around to places you can’t get to in those games, revealing some interesting secrets—before, looking at some of the concealed areas of games like BioShock and The Last of Us. 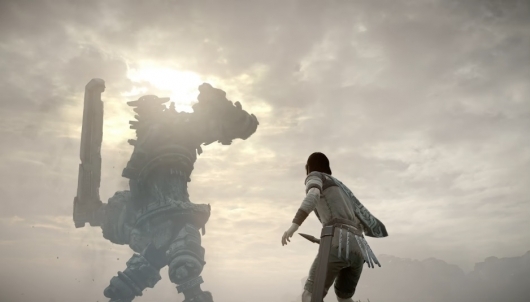 For a pair of their latest videos, the series peeks behind the curtain of Shadow of the Colossus and Grand Theft Auto V. This includes where some of the colossi are before you trigger them, visits to the Shrine of Worship and the inaccessible rooms of Michael’s house, and even a closer look at that hidden alien at the beginning of GTA V.
It’s already been over three years since Rockstar’s Grand Theft Auto V was released to the masses, demolishing records upon its arrival. These days fans of Rockstar’s games anxiously await the announcement of what’s next, whether it will be Red Dead Redemption 2 or something else. But that doesn’t mean they don’t look forward to a good GTA V video from time to time instead of watching old favorites instead. Corridor has released a video in which the world of GTA comes to the most advanced virtual reality headset ever. Basically, it turns the game into a live-action experience which might just be a little too real for some. 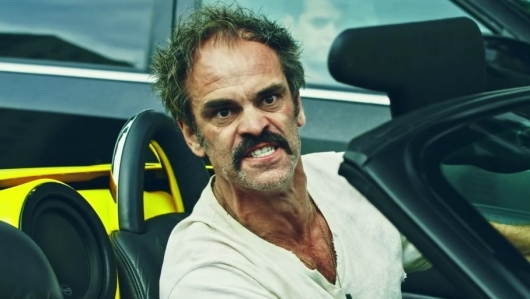 It even comes with live-action Trevor (played by his voice actor Steven Ogg—someone fans of The Walking Dead unfamiliar with the game might recognize as one of Negan’s people), who also might just be a little too real for some. Click on over to the other side to watch the video, as well as a bonus making of video. Rockstar Games has released a brand new 60 frames-per-second trailer for their long-awaited Grand Theft Auto V PC release. The game will finally find its way into the hands of PC gamers in just under a couple of weeks from now on April 14th. The PC release will also come complete with all of the heist missions that were recently made available to those playing on consoles. 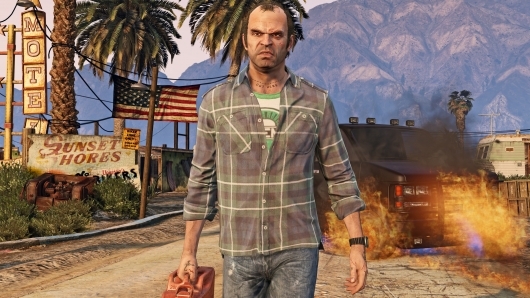 You can check out the new 60 fps trailer for GTA V on PC below. 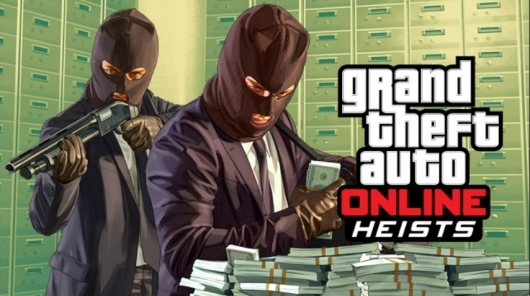 After many speedbumps and delays, the long awaited heist missions for Grand Theft Auto V‘s online multiplayer game Grand Theft Auto Online are now available in a free update on PlayStation 4, Xbox One, PS3, and Xbox 360. The heists will be available to PC players of the game when it hits store shelves on April 14th. Rockstar Games has officially announced release dates for the long awaited PC version of Grand Theft Auto V, as well as the Grand Theft Auto Online heist missions. You can now mark off March 10th on your calendar if you’ve been anxiously awaiting the online heist missions, and those of you who’ve been waiting for well over a year for a PC version of GTA V can circle April 14th. You can read the official announcement by Rockstar and also check out a collection of new screenshots from the heist missions below. We all know that Rockstar’s Grand Theft Auto franchise is the one to point at when you’re a complete and utter moron trying to blame inexcusable real-life violence on video games. Rockstar knows this too. Hell, they even enjoy it. There’s a reason it’s the one of the biggest entertainment titles in the history of mankind. People just love being naughty, even if they won’t admit it to your face, and GTA lets you be a little (OK, a lot) naughty without breaking any real laws. Most are fully aware video games are harmless, and that a ridiculously large amount of people play them—including the ultra violent ones like GTA—without running out their front door and shooting everyone in sight after playing. Sure, there’s a few people who do. But there’s a whole lot more dark and twisted going on in those peoples’ worlds than just a gaming hobby. The people who do try to blame violence on video games are usually psychotic middle-aged soccer moms who’d rather point the finger than, you know, do a little basic parenting, or older folks who stare dumbfounded at Fox News all day long like it’s the latest episode of Everybody Loves Hypnotoad. 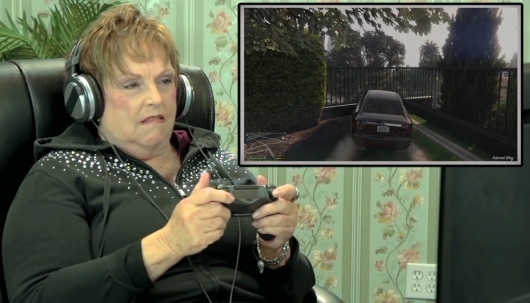 In the latest and one of the more fascinating videos from the popular REACT YouTube channel, a group of older folks play the latest game in the series, Grand Theft Auto V. And the results might just surprise you. Watch the video here below. Rockstar Games has decided to delay the PC release of Grand Theft Auto V, and some eager fans are not at all happy about it. After a lengthy wait for word on a PC release of the game, it was revealed in November—about a year after the console version was released—that it would finally be made available this month. A couple of weeks from today, actually. But now the developer has decided to push that back a couple of months to March 24th. Continue below for more, and to also see the minimum specification requirements, the recommended specs, and the first PC screenshots. It’s a slow news day, as you might have expected, so why not watch some more remakes of the Star Wars: The Force Awakens trailer! 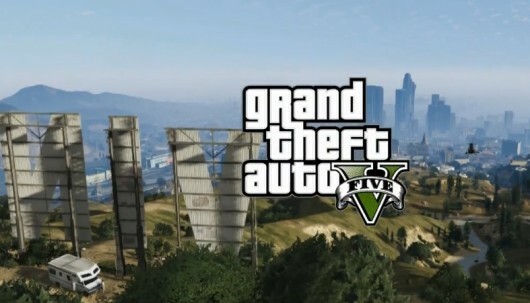 This time it’s a pair of trailers that were remade using Grand Theft Auto V as well as its online multiplayer option Grand Theft Auto Online. One uses player-created characters and the other uses more familiar faces from the game. You can watch both below.